I’ve been involved in nearly 100 Twitter chats over the years. In the early days of Twitter, I created a Twitter Chat called #AdChat which ran for about a year. It was lots of fun and was one of the first Twitter chats about marketing. In addition to #AdChat, I ran a Twitter chat that was all about life as a 90s kid. Today, you’ll find me involved in Twitter chats like #Bufferchat and #TwitterSmarter and many more. I’m a big fan of Twitter chats. They give you the opportunity to connect with a wide range of people about a topic you’re passionate about. You have the chance to meet new people. You have the chance to share ideas. You have a chance to make relationships that could forever change your business or life. The key to seeing these benefits come to fruition is being a quality member of the Twitter chat. In this blog post, I’m going to share with you some of the strategies I’ve used when hosting or joining a Twitter Chat. These are just a few of the different tactics that I’ve seen used by some of the best. I talked about the value of using compelling images on Twitter when I launched the Ultimate Guide to Content Curation. Studies consistently show that Twitter users love it when a tweet is filled with visuals, videos, or something a bit more unique than standard text. Twitter’s official blog suggests that tweets with images are 35 percent more effective at generating retweets than those without, so embrace it! But don’t limit yourself to static images. Twitter also allows the usage of GIFs! Whether you pronounce it “GIF” or “JIF” doesn’t matter—GIFs have made it easier to convey emotion, instant humor, and behavior. Take advantage of the native GIF integration on Twitter, or use a site like GIPHY to find some of the most relevant or hilarious visuals to support the points you try to make in the Twitter chat. They call it a Twitter chat for a reason: You’re supposed to chat! A lot of people join Twitter chats and try to steal the show by constantly pushing their own thoughts without actually interacting with those being passed along by the other attendees. Instead, you want to share thought starters that drive conversation and actually interact with people. You want to engage frequently. The more interactions you have with people, the more likely they are to follow you and keep the conversation going once the chat is over. I’ve met some great people through a variety of different Twitter chats over the years. Some of these people have grown to become great friends, clients, and connections. If you develop tweets well in advance, make sure you include the hashtag in the pre-developed tweet. 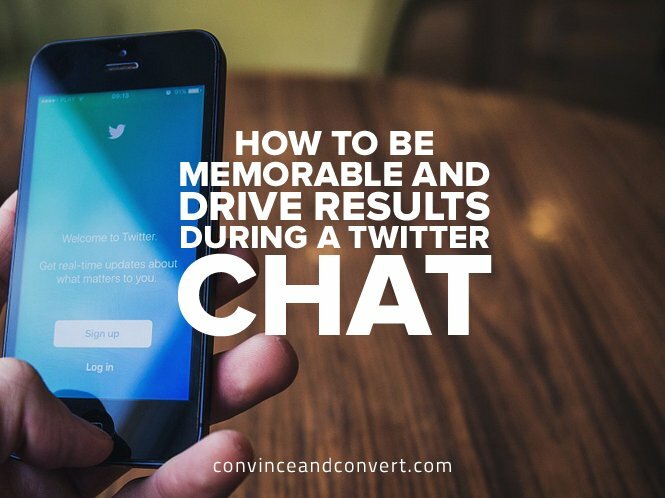 For the various conversations you have throughout the #TwitterChat, it’s really on you to remember to include it. Going into a Twitter Chat unprepared is like playing Risk without reading the rules. You can probably do okay, but you would have done better had you prepared. With information like this, it’s easy to create a word document with pre-developed tweets that you can cut and paste during the chat as answers to the questions. This will allow you to spend more time focused on engagement rather than thinking about answers for every single question. Some of the best Twitter chats have been the ones in which I’ve seen users of Crate or some of my followers chime in. It’s always great to have conversations with new people, but having a few familiar faces in the mix can make a Twitter chat extra special. You might not be best friends with them, but maybe you’ve interacted before and have a bit of rapport. You want to have these relationships because you can give each other support, interact more intentionally with one another, and have a more organic conversation. Tweeting about a Twitter chat beforehand is a great way to bring a few of your connections for the ride. In addition to increasing the likelihood that you’ll know people in the Twitter Chat, you’re letting people know that a consistent flood of tweets is coming soon. When taking part in a Twitter chat, you simply upload a hashtag (like I’ve done in the visual above) to a feed, and a stream will fill with content using those variables. As the tweets come in, you have the ability to interact directly on Twitter’s Dashboard without leaving your browser. You can also include your own Twitter handle to ensure that you’re seeing both mentions and tweets from the chat. The dashboard comes in handy—the alternative is using Twitter search and bouncing back and forth between pages. #BufferChat: One of my favorites, it’s held every Wednesday at at 9 AM PST. The guests tend to range from social media marketers like Christin Kardos to organic conversations between the Buffer team and the chatters. #BufferChat has a schedule that showcases both the recaps and upcoming chats online. #SEMRushChat: Each week the team at SEMRush host #SEMRushChat, a discussion around all things content, SEO, and inbound marketing. SEM Rush creates great recaps, like this one all about developing high quality content, so if you happen to miss one, you can check it out later. These chats are held every Wednesday at 11 a.m. ET. #TwitterSmarter: Twitter Smarter is a Twitter chat from Madalyn Sklar that talks about boosting and enhancing your presence on Twitter. Each week on Thursday at 1 p.m. ET, a special guest joins Madalyn and a passionate group of marketers, professionals, and executives to discuss Twitter and social media. You can check out the recap from my #TwitterSmarter chat all about content curation on their website. Are there any other Twitter chats that you think are worth checking out? Do you have an idea for a Twitter chat? Comment below! Ross Simmonds is the CEO & Co-Founder of Crate, a content curation platform that offers users relevant content suggestions for them to share online. Ross is also the co-founder of Hustle & Grind, a lifestyle brand for entrepreneurs. With a passion for tech and entrepreneurship, he's helped many brands through as a consultant leverage content marketing to drive real results.